The large and strange word dangling above simply means “the fear of lizards.” As someone who believes language should adjust itself to the culture that uses it, I would personally prefer to see this word replaced by the much easier “lizardophobia.” It’s embarrassing enough to be afraid of lizards; not being able to pronounce the condition is like adding another layer of cruelty to those who cower in horror at the sight of a salamander or a chameleon. My will was strong and I didn’t go to management, but seeing that there was a lizard loose in the room, I left. The presence of the lizard kept me away, and with nothing else to do I sat at a coffee shop and read. After my second or third cappuccino, I couldn’t let my lizard paranoia get the best of me anymore. Returning to the room, I threw the pile of the clothes into the air. No lizard. There was, I noticed, a long tail coming from under the mini-fridge. I was paralyzed with terror. “Just leave it alone,” I thought. “Maybe it will go away.” For the rest of the night, I kept an eye on the tail. It wasn’t moving, but that didn’t mean that the lizard wasn’t a threat. If only I could communicate with it, I pondered, then the lizard and I could work something out. I wished that there was someone who could be a middle person – a lizard negotiator if you will – and help me understand just what the lizard wanted. “What are the lizard’s intentions?” I’d ask. “The lizard intends to crawl on your face,” the negotiator would likely answer. I would ask the lizard negotiator more. Even after going out for a few beers, I couldn’t sleep in the room. Not with that tail there. Finally I decided I had to move the refrigerator and deal with the lizard. I put socks on my hands and pushed the mini-fridge, exposing more of the tail bit by bit. Then, with one last shove, I moved the mini-fridge quite a ways, only to discover that there was no lizard. There was only a tail. There it was, right there. All my fear, represented by a light green tail, sitting motionless on the floor, connected to nothing. “The lizard understands the risks.” Brilliant. Funny story — definitely not in Manhattan! How could you be afraid of that guy? He is awesome! I liked your post; I’ve been in foreign countries before where people would call you a puss for being scared of whatever is skittering around the room! We have a leopard gecko at our house (my 9 yr old’s pet, evade) and I admit he freaks me out. When he dropped his tail, it really freaked me out. We co-exist, but warily on both sides of the tank. Lizards are harmless. Some of them make great pets such as Bearded Dragons (My wife has a giant one). They are gentle. If they don’t run away from you then you should be worried. Damn iPad; “evade” should be “egads.” oh how I hate autocorrect. I am definitely not a lizardophobe, but the lizardless tail would be the thing to send me screaming from the room! Your lizard negotiation was hilarious! I love how matter-of-fact the negotiator in your mind was – of course it will crawl on your face. Ewwwwwwwwwww! I think that might scare me even more…to know that there was a tail-less lizard running around! I definitely would have called management. You’re a brave soul! Any-who, I hope you enjoy a lizard-free day! Good story! I’ve heard that some lizards can lose their tail if a predator grabs it, and they can grow a new one. When I was a child I wished that I was afraid of normal things like bugs, spiders and snakes. Instead I had a morbid fear of people and no fear of the creepy crawlies. People fear is hard to deal with. I finally got rid of the fear and can be around people without any anxiety now. PS: My son spent a month traveling around India and he said there were lots of little green lizards in the motel rooms he stayed in. I suspect they are there because there are bugs for them to eat. In that case, I would welcome them. I much prefer lizards to bugs, but thats just my view on things! i feel like this could be turned into some elaborate, existential type short story! loved the ending. congrats on FP! oops it shows the common phobia in Pakistani politics , rulers and politicians are badly affected by this phobia. Im deathly afriad of snakes, however I like lizards. But aren’t snakes kinda like lizards without the feet? Great post, and Congratulations on being Freshly Pressed. I would have spent the rest of the night looking for the tail-less lizard. Great post! Haha, great story. A cat could be a great solution to any lizard/pest issues. Your lizard negotiator was right on; the little lizard apparently knew the best way to cause maximum unease without any risk to itself. Brilliantly devious. This is hilarious. I love the imaginary conversation with the Lizard Negotiator. It’s funny how we let stupid fears get the best of us sometimes. Great post! I love the little conversation with the lizard negotiator. I have a lot of conversations in my head that never actually happen in real life. Usually they are with real people, not negotiators of this sort — but still, I can relate. -So Funny! I am totally with you. I would not want to have a lizard loose in my room. What happened to the rest of the lizard? Isn’t that true with any of our fears? Great post and congrats on being freshly pressed. I love this. I behave the same way when I see I mouse. Funny thing is that I totally realize the mouse is equally afraid of me, but that doesn’t mean I am okay with sharing my space with him. Note to self: Pack Lizard repellent when traveling to Bangkok. Thanks for the fun read this morning. The lizard was scared of you too, it shed it’s tail! This is the human equivelant of scaring the $h(eye)T out of someone. Hahaha great story! Sometimes our fears are more in our head than they are reality. I am surprised by the fear of lizards, most people are scared of snakes or spiders. ROFL! I used to raise lizards and snakes when I was a kid growing up in New Mexico. I had a couple of friends who refused to come on to the front porch because of them. I respected their apprehension and would never try to goad them into handling one. The reptiles were a great deterent on one occassion when a jerk wouldn’t take no for the answer to his repeated date requests. I was cleaning Igor’s cage (he was a Collared Lizard). Igor was sitting on my shoulder while I was cleaning. I stood up as soon as I heard the jerk come up the walkway. Igor moved the the nape of my neck as I stood up. While the jerk was once again…and rather rudely…trying to convince me to go out with him, Igor decided to make an appearance by climbing up the back of my head an perching on top. The jerk turned pale and started stammering. I realized at that moment that he had scoliodentosaurophobia. Fighting laughter, I kept a straight face and told him that Igor was trained to attack. The idiot turned and ran away. He never even so much as looked at me in the school hallways after that. Thanks for posting this entertaining story. Would you mind if I reposted it to my FaceBook page? I have several friends who would also enjoy reading it. Jeez, please do repost it. That’s very flattering. You should bring Igor with you on any social interaction you’re a bit apprehensive about. I would think that having a lizard crawl onto your head would be an excellent way to bow out of an awkward situation gracefully. Ah, the joys of finding lizards in your house. Florida was horrible for that. Unfortunately we had a cat with a habit of dropping them after she’d played with this. There are worse lizard pieces to find. Much sympathy for you, I hate the thought of anything under the title ‘creepy-crawly’ on my skin. You should have eaten it, Scoliodentosausage. That is seriously a great tale! (Get it TALE, like a lizard’s ta…ya, you get it. Congrats on being freshly pressed. Does that mean the lizard is elsewhere without his tail? I feel exactly the same way about spiders. Arachnaphobia is just a fancy word for smashing any spider with my shoe. Hah! Loved your story and your humor. I hope that you don’t have a return of the Lizard, with or without his tail. Personally I’m more afraid of snakes. But I don’t think I would want a wild Lizard wither. The conversation with the negotiatior is genius. ‘The lizard intends to crawl on your face.’ HHHHAAAAA!!! Love it! Reminds me of my fear of dentists. My friend asked me what I thought they were going to do….’KILL ME!’ I screamed into the phone with all the seriousness I could gather. I feel your pain. Haha..very entertaining story! I am not scared of lizards, however, I do wish that a spider negotiator existed. What a funny piece! The lizard negotiator was worst-case-scenario-honest, wasn’t he? “Of course he’ll crawl on you in your sleep.” The picture is perfect for someone with lizardophobia. I imagine they all look like that to you. I’d be scared, too! Eewwwww, I have to agree with you. I can’t believe you were frightened so long and it was just a tail…damn! You wouldn’t like it here in AZ, we have those critters running all over the place, it took SOME getting used to…yet I’m still not…I still get startled every time I see a big one…they just look so prehistoric, I feel like I’m living in the Flintstones times in Bedrock…every summer we have one come down off the mountain to live under, wait for it, our little refrigerator! They like the humidity the compressor produces. Go figure. Good post & good luck with your phobia! Loved your post. It’s a very cute story. I am scared of all lizards except for bearded dragons, which I had the pleasure of owning one as a pet. It may seem weird, but for some reason bearded dragons are cute rather than scary. Anyway, congrats on being Freshly Pressed! “The Lizard intends to crawl on your face…” Funny! I wonder where the Lizard was, and why he left his tail behind?! Are you sure about “Scoliodentosaurophobia”? “Saurophobia” sounds more reasonable to me. Sorry that you are scared of them or him for that matter, but it was a very entertaining story. I used to own a pet store a long time ago & I sold lizards. He was just looking for something to eat! This is a hilarious post! As the world’s biggest arachnophobe, I have so much sympathy for you. I live on lovely Amelia Island, in Florida. Lizards are a daily part of life, especially in Summer. They often come inside the home. My only fear when they come inside is that the cats will capture and kill them. As a result, weekends often entail me chasing a lizard or two, in order to set it free from my felines. Haha. Funny story. That picture is hilarious too. I was born in Sri Lanka. It was fairly common to see gecko’s crawling along the roof. I hated it when they suddenly dropped. For me, it is not so much a phobia but a level of distaste. I’m sure that by now, you’ve considered the real possibility that having defensively snapped off its tail, the rest of the lizard is still ensconced in your room. I take no pleasure in pointing this out, but there we are. Perhaps tailless lizards are somehow less horrifying? I knew some musophobes who find the tail to be the most repulsive and aversive part of the rat. Dang, you know what’s funny – it honestly never occurred to me that the tail-less lizard could still be around. Why didn’t it? That’s perfectly logical! I just saw the tail and thought “thank God it’s gone!” I’m a moron! nah, lizards are kinda cool!!! What a great story! I thought for sure the “tail” was going to be the refrigerator cord. 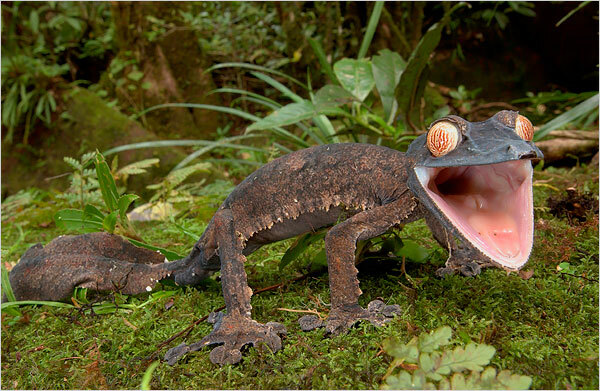 I’m not afraid of lizards, but I think if I ran into one like the picture above, I’d wet myself… yipey!! Oh, congrats on the “Freshly Pressed” (guess I’m the first to comment). I was afraid of lizards, do not know since when I did not feel like it when they see it, it always caused me to feel unsafe or unhappy . Amazing specie you have there. I have a sail fin dragon living in my home and they are really fascinating and amazing animals. There’s a lot in that brief but fantastic little story. I dig it. You do know that lizards in Bankok are beneficial to have in your room because they eat bugs? The kinds that will bite YOU. Well, perhaps a lizard tail won’t eat a bug, but a full lizard will. However, I quite like the lizard negotiator idea. Very weird, very quirky, very amusing. So funny – I was just thinking of the tails coming off the jing-joks when I was scrolling through your post before I even got to the end. If you try and catch them, you’ll always be too slow and just catch their tails, which will easily separate from their bodies. We used to do that all the time as kids visiting Krung Thep (Bangkok). They are harmless little geckos! It was always fun to see them crawling up the walls. Next time I will happily serve as your negotiator. Good luck in your next encounters! heheheheehee! i love it! living in the philippines, i have developed a profound love for the house lizards, but only because they eat my own personal phobia-inducing creature…the ROACH! we have flying ones here…as i’m sure you do, too! anyway, i’ve taken to calling all the house lizards george…as in, when they jump out from behind the curtain i’m pulling back, ‘george! you scared me!’ or if i see one of the afore-mentioned horrible roaches, ‘george! you’re not doing your job around here! i have to do everything in this house!’ i’ve even written them a little poem: http://whatifandwhynot.wordpress.com/2010/12/05/ode-to-the-house-lizard/…loved your post! heheheheehee! i love it! living in the philippines, i have developed a profound love for the house lizards, but only because they eat my own personal phobia-inducing creature…the ROACH! we have flying ones here…as i’m sure you do, too! anyway, i’ve taken to calling all the house lizards george…as in, when they jump out from behind the curtain i’m pulling back, ‘george! you scared me!’ or if i see one of the afore-mentioned horrible roaches, ‘george! you’re not doing your job around here! i have to do everything in this house!’ i’ve even written them a little poem: http://whatifandwhynot.wordpress.com/2010/12/05/ode-to-the-house-lizard/ …loved your post! I feel the same way about birds… when they´re fluttering about in my room (they sneak in because I leave the window open in summer), have to yell for a bird negotiator to explain to the bird that I do not appreciate it twittering next to my ear all night long. lol. i like this article. superb writing skills. This makes me feel very uneasy. So think about it…you were watching the Lizard, the Lizard was watching you. Someone, somewhere was watching the both of you. I think you avoided certain death by leaving the room. That someone feasted on the Lizard. Whatever else lurks, it doesn’t under piles of clothes. Haha – thanks for this! It’s creepy, but it made me laugh. Fun read! Thanks for the morning story! Ah yes, sometimes fear is irrational; sometimes it’s justified. Now if we could only figure out the when and the where and the difference between the two. May Bangkok be lizardless for you for the remainder of your stay. I have read your blog.nice share information. Wonderful! The way you write is simply wonderful! And I can recommend the Bayoke Sky Hotel. No lizzards there. What happened to the rest of the lizard??? Usually they drop their tail if it is trapped. Now you have a tailless lizzy running around. I too used to be utterly freaked out by these creatures. Then when my son neglected one he took home as a pet. I got used to it and began cautiously taking care of it. I gained some notoriety in the neighborhood over the years we had “Iggy” as the woman with the huge iguana on her shoulder. He grew to almost 4 feet head to tail. He never dropped his tail. The lizzy probably would have visited you on the bed if it hadn’t trapped itself under the frige. I iiked the picture. outstanding!!! My cat use to bring me tail-less lizards from the lanai and drop them on the floor, only to see them scamper underneath furniture. Yuck. I’ve had to move countless pieces to recover the hidden dragons. Needless to say, my two cats no longer go out onto the lanai. Where did the lizard go, if it left behind its tail??? HAHHAHHAHA! I like the idea of a lizard negotiator. I LOVED the hypothetical conversation with said negotiator, as well! I love lizards. I had an iguana, Igor, and countless chameleons and newts, etc. I love that picture, although I bet he could take your face off…well, maybe. I love the lizard picture you included! I wish I could tell you “Calm down, it’s just a lizard.” but I know that for people actually having a phobia things don’t work that way. So I’ll just say that this blog is a good way to shed light on and express your fears. lol. Wow! Thanks for all the comments. I had a total of two comments for my entire blog going into the weekend, so it was pretty shocking to log on last night and see this. Apparently, being a bit uneasy around lizards is pretty easy to relate to! Anyways, glad people enjoyed this little bit of silliness. Cheers! Or maybe we don’t need big words – “I’m scared of lizards” would probably get the point across. That’s horribly disturbing. Make sure to sleep with your mouth closed! Thanks so much for the kind words, Phazer! You’re really funny man!! hahaha! ROTFL. That was an interesting story though. Hahahah! I really hate lizards too! it really scares the hell out of me! hahaha having the thought of their face makes me jump wherever i am . The lizard negotiator was really cool. I hope i could meet one too lol. get rid of all those which are no longer viable. 12 months in exchange for upgraded kitchen appliances. the blind “intervention” is not wise. You can also opt to select a wood finish for your French door refrigerator that matches that of your kitchen cabinetry.